Students in north Bengal's biggest university today disallowed classes to protest a research scholar's alleged molestation on campus yesterday, a crime many said was becoming a regular menace. The PhD scholar of North Bengal University has told authorities that when she and two other women scholars were on their way to the hostel from their laboratories around 2pm, a bike-riding man wearing a helmet "touched her inappropriately" and sped away. "Three PhD research scholars (all women) were returning to the hostel from the department. The area where the science departments are located is isolated and as it was a holiday yesterday there was nobody around," said Musharraf Hussain, president of the NBU Research Scholars' Association. Research scholars are allowed to go to laboratories and work on holidays. Hussain said the person on the bike was an "outsider", although the identity of the biker is yet to be established. He said: "Two guards were supposed to be on duty at the spot where the incident took place but they were not present." The university has showcaused the two guards. The victim and the two other research scholars who were with her did not want to speak to The Telegraph. According to university sources, the trio immediately reported the matter to the watch-and-ward unit - the office of the security personnel - after which the varsity lodged an FIR at Matigara police station. When the university officials were asked about security laxness alleged by the students, they admitted that CCTV coverage and gaps in the boundary wall - two points cited by the students - were problems. Yesterday evening, the students held a candle-light protest on the campus. 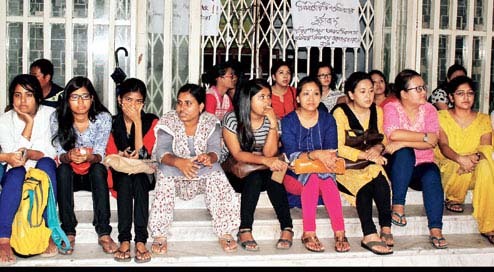 They withdrew the protest after midnight on the assurance of NBU officials that their demands would be looked into after vice-chancellor Somnath Ghosh returned to the campus on Wednesday. Ghosh is out of town. Today, however, a section of students blocked varsity departments and administrative buildings at 8am. Only some semester exams were held. The students alleged that such incidents were frequently happening and the authorities had only given them verbal assurances about tightening security. "Teasing and incidents of molestation have become frequent on the campus.... In March, there was a similar incident of molestation on the campus and we protested. The authorities made promises to us but nothing substantial was done to upgrade security. They always tell us that the whole campus will be under CCTV surveillance but there has been no progress on that. There is no proper boundary wall enclosing the campus. As a result, outsiders can easily enter the campus through gaps in the wall," said a PhD scholar.